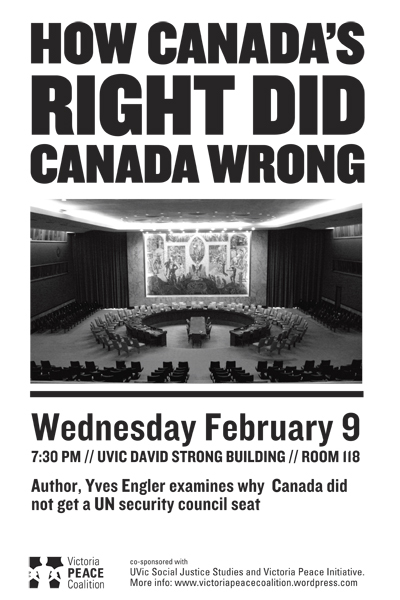 Yves Engler examines Harper’s foreign policies and why the UN did not promote Canada for a seat on the Security Council. Please join us for a presentation and discussion Canada’s foreign policy with the author of The Black Book of Canadian Foreign Policy. Yves Engler is a Montréal activist and author. He has four published books: The Black Book of Canadian Foreign Policy (Shortlisted for the Mavis Gallant Prize for Non Fiction in the Quebec Writers’ Federation Literary Awards), Playing Left Wing: From Rink Rat to Student Radical, Canada in Haiti: Waging War on The Poor Majority (with Anthony Fenton) and the recently released Canada and Israel: Building Apartheid. Everyone welcome. Donations gratefully appreciated for expenses. Sponsored by UVic Social Justice Studies, Victoria Peace Coalition, Victoria Peace Initiative.